Palacios-Barrios, E. E., & Hanson, J. L. (2019). Poverty and self-regulation: Connecting psychosocial processes, neurobiology, and the risk for psychopathology. Comprehensive Psychiatry, 90, 52-64. 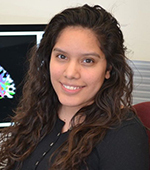 Kudos to Esther Palacios-Barrios, graduate student of Jamie Hanson, who was recently awarded a Ford Foundation Fellowship.